Update 4/15/2019 - 14 New testimonials posted. We think we do a great job but don't take our word for it. Many of our customers are glad to share their experience with us. Below are very recent comments/testimonials from our clients to help show we offer some of the best auto repair oil change services in Hawaii. The staff are wonderful and the service is excellent.i am very happy overall with the service ? A well organized shop. Everyone there was very receptive to my urgent needs. Thank you ! Laurie and Sean are always so enjoyable to work with! Actually the entire staff I?ve encountered is great. The team at Midas Kailua have been great everytime we visit. A busy workshop but always take the time to explain and quote accurately. Customer service person was very knowledgeable and listened to my needs. He was very courteous and friendly. I would have rated 5 stars but my car took longer than the time I was quoted. About an hour longer. excellent service from the whole team especially Godo and Lisa!! The best!!! All receptionists are very friendly and very helpful. I?ve always had great and prompt service . Excellent customer service and mechanical work. I trust this Midas location. They take care of the maintenance on all of my vehicles. Great service. On time. Great Price. Great Personnel. Very sufficient and dependable. Get the job done!!! ?? 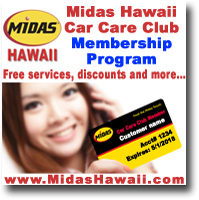 As always Godo and Lisa really makes my family and I love taking our cars in for service at the Midas Waipahu. The always provide us wit h excellent customer service and care! I will make the drive to Kailua to know that Craig is working on our vehicles. He helps me keep track of 5 automobiles that the family owns. He makes sure I\m in and out in a short time and I know that what needs to be done is completed quickly. Gary is a great mechanic. Honest and always has a smile. Mahalo Waipahu Midas. Keep up the good work. The crew in waipahu is awesome! They're friendly and reliable! Did not have to wait that long. Very friendly. Can always count on excellent quality and friendly service. They go out of their way to earn your repeat business. Adam the manager was extremely proactive in helping me fix my ongoing tire problem. Adam represents the consummate professional at its very best. Mahalo Adam! Love my Midas team! Great staff quick service! Great customer service! Wait time was a bit long but job on the vehicle was good. Great service. Went thoroughly through the details with. Will be making future visits for other services. I would give a 5 star but you are spelling my last name incorrectly. My last name is spelled Hew Len. Great fast service!!! Outstanding customer service!!!.. They were friendly and honest. They let me know upfront what I needed and what I didn't. I highly recommend them. Awesome! We've been there for oil change and safety inspection. Everyone is kind and helpful. I really appreciated the awesome customer service and discounted oil change coupons. I appreciate the Free Wi-Fi. We streamed cartoons for the kids. Kept them busy while we had coffee and watched cable TV in the waiting room. Very convenient. Always I polite and kind. I appreciate the extra care and polite people service. Thank you. We only bring our vehicles to Midas Waipahu. The friendliness & upfront explanations of work to be done ate the best! Lots of aloha to go along with expert technicians and great service. I always get the best appointments customer service is great. The people in the front are awesome and service never takes long. I always consider Midas as my First place of business for auto repair. Great service every time. I brought my vehicle to get an inspection and I was so pleased how quickly they were able to get us in and out. Not only that but the ladies at the front counter made sure that my 3 kids were happy and comfortable while we waited. The friendly service makes me want to come back! Great service and great staff! The store manager was particularly helpful and friendly. I would highly recommend! Awesome job on my safety inspection. Everyone was friendly and engaging even when I given the wrong insurance card. Work was done in a timely manner. I got a set of same 4 tires every one else in town had none.. I needed it to be done at a certain time that was met...very satisfied. Fast and friendly service. Very comprehensive check of my truck. Other than never meet scheduled appointment (always at least 45-mins late from scheduled appt) service (all areas) is outstanding. Awesome crew. Great front desk service. Always a pleasure doing business with them. See you guys again in a few thousand miles. Your staff has always been helpful and friendly. I have no complaints and will return when I have need of further service. When i recoeved the form for my check up it was very hard to read what was good/bad due to the messy box checks. Great staff and awesome service. Reasonable prices. The work done on my brakes was very good and done quickly so I didn't have to leave it overnight. However the price was rather high and the lug nuts on the wheels were overtightenedaccording to my hubby. He had to loosen them and retorque to the proper amt. We want to be able to get them off ourselves in the event of a flat tire on the road...so that's why we re-did it. Very fast friendly and efficient. Great customer service. Completed job within the timeframe quoted especially being a walk-in. Accommodated easily with not having an appointment compared to the other businesses around. Very happy and will continue my service for oil change and tire rotations. Definitely will be coming back here to get my vehicle serviced. wonderful staff! Very helpful and friendly! Made online appointment for first appointment in morning. Car sat in parking lot for over one hour. Nothing was said to me. What's the point of making an appointment. Easy to make appointment online with phone confirmation. There was plenty of parking. Office management was helpful and knowledgable. My appointment which included oil change and safety inspection was completed within an hour. I will definitely come back! TIMELY SERVICE AND VERY THOROUGH FRIENDLY TOO. Courteous professional and efficient. More parking would be nice though. Midas Kailua has great customer service. The receptionist had a great welcoming attitude right when I stepped in the door. The mechanic and I think he is also owner of the shop was phenomenal. I think his name was Craig. He gave me some pointers about my vehicle and advice of what services I could hold off on doing. I had great customer service that I will always come back to Midas in Kailua. Thank you! Great auto service and friendly staff! i had made an appointment for brakes in the afternoon with the assurance that they could be repaired that day. When a mechanic went home sick I was told they couldn't do it. Well I was angry since I live in lower Puna and didn't get to Hilo often. The manager then stood up and said he would work overtime if I wanted to stay past closing. I stayed and it was fixed. Mahalo to the manager for going beyond and helping out a frayed customer. It is so nice to feel you have a 'neighborhood' repair shop. I had forgotten to renew my safety inspection...last day and I needed it fast. After several other locations failed me, Midas was quick, professional, and got me on my way. I now know where I will go from now on. Thanks Midas Kailua! It is so nice to feel you have a 'neighborhood' repair shop. I had forgotten to renew my safety inspection...last day and I needed it fast. After several other locations failed me Midas was quick professional and got me on my way. I now know where I will go from now on. Thanks Midas Kailua! Midas was extremely helpful changing the secondary battery in my old Ford Econoline van, and then helping me a trailer inspectkion. They patiently explained to me how to get all my paperwork in order (my registration had expired) and were very friendly at all times. Midas was extremely helpful changing the secondary battery in my old Ford Econoline van and then helping me a trailer inspectkion. They patiently explained to me how to get all my paperwork in order (my registration had expired) and were very friendly at all times. The service was friendly, and professional from the girls at the front desk to the technician who fixed my tire. Thank you!!! It was easy to get an appointment. The service was done in a timely manner and it was in and out, very easy. This visit was such an awesome experience thanks to Ashton! He went above and beyond our expectation. We left there not feeling like we had be taken advantage of like some other places we have been. Very helpful staff friendly and knowledgeable. I took two separate vehicles in for safety inspections. The front desk staff was great and friendly. It was easy to get an appointment. The service was done in a timely manner and it was in and out very easy. The service was friendly and professional from the girls at the front desk to the technician who fixed my tire. Thank you!!! The fix was good, however, it needed to be brought back for further work due to continued squeaking. The fix was good however it needed to be brought back for further work due to continued squeaking. Excellent service. I was kept up to date on the progress of my car and it was ready earlier than expected. Great service when I went in for a safety inspection and when I periodically take my vehicle in to check the pressure on tires I bought at Midas--love the lifetime warranty on the tires. Great service! Fast and friendly! Thorough evaluation of my car and potential problems. The relatively new walk-in safety check service is great. No more appointments. It took no more than 30 mins. Courteous and knowledgeable. Was treated with respect and felt valued as a person. Mike was great when I took my truck and had a problem. Brought right back and he fixed the problem. I am so thrilled with the service I received. The staff at Midas were amazing and kind. I won t be taking my car anywhere else in the future! You now have a lifelong customer! I Enjoy Taking My Nissan Pathfinder For Service And Repair To Midas Services Waipahu Wonderful Customer Service And Honest Technicians You Can Trust Working On Your Vehicle For Service And Repair With A Short Waiting Time !!! Honest Technicians You Can Trust !!!! Efficient - easy to get appointment. Since you guys did an amazing job on my car and did the work quickly, mind washing my car too? Kidding!!! But keep up the good work! Keep up the great customer service...very pleased.. I am pleased with the service each time I have my car serviced by Midas. David took us in immediately and understood we were a business that relies on an operating fleet. They called to confirm the extent of the service and had our truck fixed an ready for pick up promptly. Everyone we encountered was professional and committed to our satisfaction. I was pleasantly surprised. Thank you. Lisa, the Customer Service Executive does an excellent job with the customers. The best thing is she treats each customer the same that is with a cheerful greet, friendly smile, and a lot of Aloha! Much Mahalo Lisa, you are the reason I keep coming back! I did not have high expectations from my visit. However, after meeting Richard and the other employees, I believe this group is one of the best service providers I have ever experienced. They are hardworking and no nonsense. While vehicle servicing is time consuming, they get it done with the utmost professionalism and speed which provides added-value and comfort for the customer. I will definitely be back to visit this location and will spread the word! Can''t find a better place to have needed work done. The front help, Lisa and Trish, are excellent, warm, and efficient. Mahalo, Ladies. Good quick professional service by the staff. Midas has an awesome staff and always do great work. Thank you for servicing my cars all these years!!! Really friendly staff. Explained any problems well. Keep up the awesomeness. The Staff is awesome and pleasant! The workers there have been given me great service for 10 years now. love this shop. have been going here through 3 cars now and highly recommend them. I generally work with Sean but he was off the day I went in this time so Tyler assisted me. Tyler is awesome too! Such a great experience. He offered upgrades and I honestly would have done them but I need money for a trip soon. He explained everything well and provided me with a printout of the results of my concerns. I ll need more work done soon. Switching to Midas in Hilo a few years ago was such a smart move. Love the customer service!!!!! Went in for a safety check and oil change. Everything was handled in a timely matter. The only thing that bothered me was that nobody got back to me in regard to the appointment request I made the week prior to coming in. When I called about 4 days later, I was told I wouldn''t need an appointment since I was coming in first thing in the morning. Still, it would have been nice if someone had got back to me as was noted when I made the request. Love this Midas, mainly because of the quick service, customer service and honesty of the workers. Mahalo for keeping customers like me very happy! Service was great. Went in for a safety check at about 7am to beat the rush and it took only about 15 minutes. The guy at the counter was very friendly and professional. I just moved here from the mainland to help my in-laws facing substantive medical issues. It''s good to know the one thing I don''t have to worry about is finding a qualified mechanic. I have Midas in Waipahu! Mahalo for taking care of me so well and professionally. You welcomed all of us customers, as if we are ohana. The Aloha spirit is alive & well and I appreciated it! Thank you! We have recently moved to this area, so had no idea about where to take our vehicle for a Safety Check. We happened to stop in at this Midas shop and are pleased that we did. As I wrote above, the walk-in and phone customers were all treated with friendly professionalism. This Midas shop will definitely become our "go to" place for our vehicles. just the time it took to complete the job i thought was to long. But everyone was very nice and the service was great. Good work and caring staff. I neede quick help and they fit me in. These guys are great! They go above beyond -it's the little things that count. Helpful advice etc. ? Midas in Waipahu Hawai i is a gem! The staff is friendly and knowledgeable. The prices are very reasonable and the work is done fast, clean and professionally. This will definitely be my go to shop for all future repairs. I m glad we chose to go to Midas otherwise we would have never known how awesome this shop is. Great job guys!! You ve gained a new customer for life. Great customer service and Craig always does a great job! Very prompt and efficient service at a very reasonable price! You guys are doing good. Keep up the good work. See you soon. I'm happy with the customer service at Hilo Midas. My safety check was completed timely. The guys are very friendly and patient. Chad is great! professional and friendly. OilChange included a tire rotation. Glad i found this place on Kauai. I enjoy your staff. Always polite and pleasant! Support when enter the office begins with a staff that is very helpful and friendly and treats everyone like family. I have been with Midas, Dillingham Blvd. for over 15 years now and will continue to have them service my vehicle. I went there to get my safety check done. They gave me an estimated time and amount ahead of time. It was a lot quicker than they said which was great. I appreciate it! Rico and his team is amazing. Great customer service and communicatoon. Suoer friendly and knowkefgeable staff. Eould and will revommend midas kaahumanu to EVERYONE. My one stop shop for my safety check and oil change. Thank you Midas Kailua! 5 stars! Great service! I recomend to take your car to Midas! Excellent Service! Unlike other Midas shops visited? this Manager has employees well attuned to providing and consistently maintaining excellent customer Service during every visit. Fast friendly service. Properly put my break oil cap on which had alerted me with a warning light. Thank you! I really like coming here for my vehicle because the staff is very nice. However my concern with this visit was the wait for my vehicle and that my battery was drained when I picked up my car. I think it was because it was backed up due to the false missle alert that it was delayed so I can understand. But the i was kind of frustrated that my battery was dead when I started it up because someone who inspected my car left my lights on when my vehicle was off. Just wanted you guys to know my concerns so you guys are aware no to drain someone s battery again. When I first got there I forgot to give my coupon to the agent. I gave it to snother agent who confirmed which was my vehicle. When I checked my receipt later that day I noticed that I did not get the special rate. The coupon also included tire rotation, which I could tell was not done. I also meant to ask the agent if they could fill my tire with air as it was low but forgot. I would think out of courtesy they would''ve done it automatically as you could see the light on the dash indicating the tire pressure was low. Called around 10 am and was told to come in at noon for a safety check. did so and was done in about 35 minutes. Lots of people were walking in for inspection and told not for a few days at least as inspector does not work every day. it went well for me but my advise is to call and make an appointment. Lisa and Godo makes me feel so welcome! Midas Waipahu is Awesome! The mechanics left a connection loose. an engine warning light came on. From past experience there is a $75 charge to hook up the car to a diagnolstic device to find out what is wrong. I bought the device and tested it myself for less $ and found the problem. sometimes i wonder if this sort of sloppy work is done on purpose to get you back to the shop for more unneeded work. i think you've lost us as a customer. The staff are all friendly and I get a good service at Midas Waipahu for my Hyundai Sonata and Ford Mustang. Thank you! Three managers back, i felt you had a honest shop. When she, the manager left, i could feel the honesty slip away. 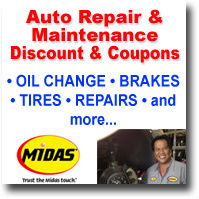 Excellent service by Midas personnel -- Godo in Waipahu and Craig in Wahiawa! Can always count on them for prompt customer service at affordable prices! Truly valued partner in servicing our cars! Was not clear about what caused the problem. For over 40 years, Midas Hawaii have been serving the Hawaii community. We haven't documented many of the testimonials from thousands of people that we has served throughout the years. We now want to get the word out and build Midas Hawaii testimonials so please consider submitting one about your experience about Midas Hawaii. 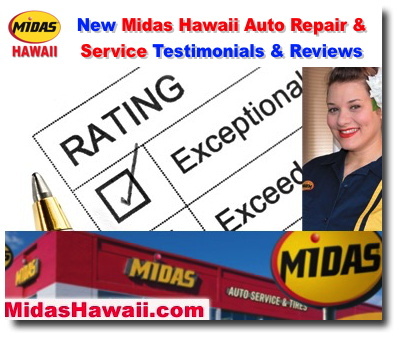 Click here to submit a Midas Hawaii testimonial.